Prostate health is a major concern for all men as we grow older. One out of every seven men will be diagnosed with prostate cancer in their lifetime, and as many as half of all men will experience symptoms of an enlarged prostate (BPH) by age 60. No matter what your age is, you can make changes to your lifestyle that can have a positive impact on the health of your prostate gland. In order to maintain a healthy prostate, it is absolutely essential for men to make sure that they are eating food that help to promote good prostate health. Below are just a few of some of the most useful fruits and vegetables you can consume to help boost your prostate health. Pomegranates are noted for being high in antioxidants and a nutrient called ellagitannin, which especially promotes prostate health. 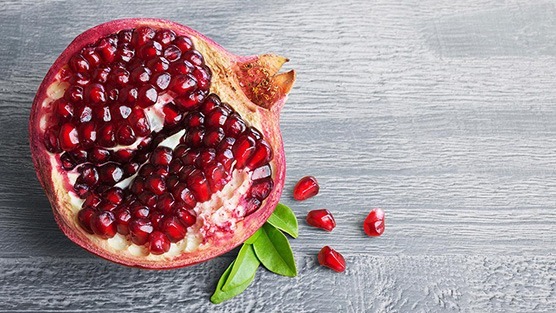 Some studies show that the pomegranate can even slow the reproduction of prostate cancer cells and can even kill them off. Pomegranates are also noted for their ability to interfere with the growth of new blood vessels, which usually nourishes prostate tumors. Most of us immediately think of oranges and citrus fruits when it comes to foods that are rich in Vitamin C, but bell peppers actually have significantly higher Vitamin C content. Peppers provide 183 mg per 100 grams while citrus fruits typically provide around 53 mg in 100 grams. Interestingly, some studies have also shown that Vitamin C from vegetables seem to do more to prevent prostate problems than getting the nutrients from fruits. Raspberries are bursting with nutrients and flavor, yet they are very low in calories. They may also be one of the best foods to fight prostate cancer because they are loaded with ellagic acid. Ellagic acid is a natural anti-carcinogen, anti-mutagen, and an inhibitor of cancer. In some cases, it has also been proven to cause apoptosis (cell death) in cancer cells. Broccoli is a vegetable that contains many complex compounds that may help protect some people from cancer. According to the American Cancer Society, some studies suggest there’s a link between the amount of cruciferous vegetables you eat and your prostate cancer risk. The reasons why are still unclear, but researchers propose that one of the phytochemicals found in these vegetables, called sulforaphane, selectively targets and kills cancer cells while leaving normal prostate cells healthy and unaffected. Tomatoes are a source of lycopene. It is a potent antioxidant that has proven itself in studies to have properties that enhance prostate health. Tomatoes’ antioxidant potency increases when they are processed. Thus tomato paste, soup, sauce or juice offer more antioxidant protection for the prostate than do fresh ones. The results of many studies show that processed tomato products really enhance prostate health. Researchers say that just a serving of tomato product every day can protect against the DNA damage that sets the stage for prostate cancer. Tomatoes are also helpful for managing benign prostatic hypertrophy. Before making any drastic dietary changes be sure to check with your doctor first, especially if you’re receiving treatment for prostate cancer as some foods may interact with certain drugs and therapies. Start taking those first steps toward eating healthier today.